U.S. politicians have a long tradition of attacking China ahead of elections. It isn’t pretty, but it shouldn’t do much long term harm. In his much-hyped remarks on trade earlier this month, U.S. President Barack Obama highlighted his administration’s efforts at targeting China’s allegedly unfair trade practices. The speech followed the signing of a much-publicized executive order on the establishment of an interagency trade enforcement center. According to the order, the center will advance U.S. foreign policy and protect the national and economic security of the United States through strengthened and coordinated enforcement of U.S. trade rights under international trade agreements. And the U.S. hasn’t been alone in targeting China. The United States, Japan and European Union recently lodged a joint complaint with the World Trade Organization against China over its export restrictions on strategically important rare earth metals. But Obama’s increasingly vocal criticism of China raises some interesting questions as the campaign intensifies ahead of this November’s presidential election, including the question: why now? The Chinese government’s trade and currency policies have come up regularly in recent years. Indeed, since the end of the Cold War, trade-related issues such as the debates over most-favored nation status, intellectual property rights and China’s currency valuation have been behind recurring sources of tension in the U.S.-China relationship. Previously, though, the U.S. government was able to adopt low-profile approaches to any problems, working quietly with the Chinese government to solve disputes. Policymakers in the U.S. government understand that when dealing with countries such as China, intense media coverage and public attention generally do little to help resolve problems. Which begs the question as to why Obama has decided to openly pick a fight with China on a series of trade issues – does he see a political opportunity in doing so? The most likely reason Obama has upped the rhetorical ante is that Sino-U.S. relations have already become a regular topic of discussion among the Republican presidential hopefuls. All of the Republican candidates have been vying with each other to sound tough on China. And the fact is that former Massachusetts Gov. Mitt Romney is not only the frontrunner in the Republican primary race – he has also taken an early lead in China bashing. On numerous occasions on the campaign trail, Romney has talked tough on China, accusing it of “stealing” American jobs and intellectual property. 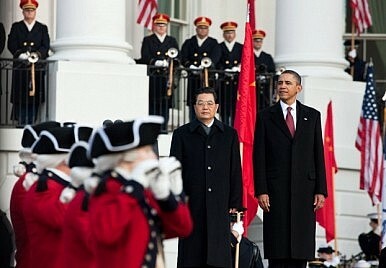 In his widely-read op-ed in the Wall Street Journal, meanwhile, Romney denounced China’s political system. “A nation that represses its own people cannot ultimately be a trusted partner in an international system based on economic and political freedom,” he wrote. “While it is obvious that any lasting democratic reform in China cannot be imposed from the outside, it is equally obvious that the Chinese people currently do not yet enjoy the requisite civil and political rights to turn internal dissent into effective reform.” Romney has also repeatedly vowed, if elected, to sign an executive order identifying China as a currency manipulator on his first day in office. Indeed, with the U.S. economy still sluggish, China bashing has become one of the focuses of Romney’s presidential campaign. Challenged by his Republican opponents over the China issue, Obama has responded swiftly, toughening his rhetoric over China’s trade and currency practices. And he has been joined by other senior officials in his administration. On March 1, for example, Vice President Joe Biden visited the battleground state of Iowa, telling voters that China is too authoritarian to ultimately beat the United States. Such remarks have underscored an important reality for 2012 – the closer the presidential election draws, the more heated the rhetoric is likely to become. Without the openness that comes with democracy, China’s relations with the US and its neighbours are destined to be tense at best.